Corporations deploying SAP software today are under pressure to reduce cost, minimize risk, and control change by accelerating deployments and increasing the availability of their SAP landscapes. Changing market conditions, restructuring activities, and mergers and acquisitions often result in the creation of new SAP landscapes based on the SAP NetWeaver® platform. Deployment of these business solutions usually exceeds a single production instance of SAP. Business process owners and project managers must coordinate with IT management to optimize the scheduling and availability of systems to support rapid prototyping and development, frequent parallel testing or troubleshooting, and appropriate levels of end-user training. The ability to access these systems as project schedules dictate-with current datasets and without affecting production operations-often determines whether SAP projects are delivered on time and within budget. 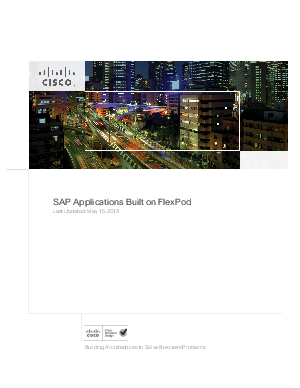 To meet these challenges, NetApp, VMware, and Cisco have collaborated to create the SAP applications built on FlexPod data center solution. FlexPod is a proven long-term data center solution built on a flexible, shared infrastructure that can scale easily or be configured for secure multi-tenancy and cloud environments. FlexPod is a prevalidated configuration that delivers a virtualized data center in a rack composed of leading computing, networking, storage, and infrastructure software components.